Sport and earphones have rarely been on the same team. Many a run has been ruined by self-ejecting ear buds, bramble-loving wires or the fact that Survivor's Eye Of The Tiger just doesn't sound as dog-damn inspiring as it ought to. But, thankfully, all that is changing. 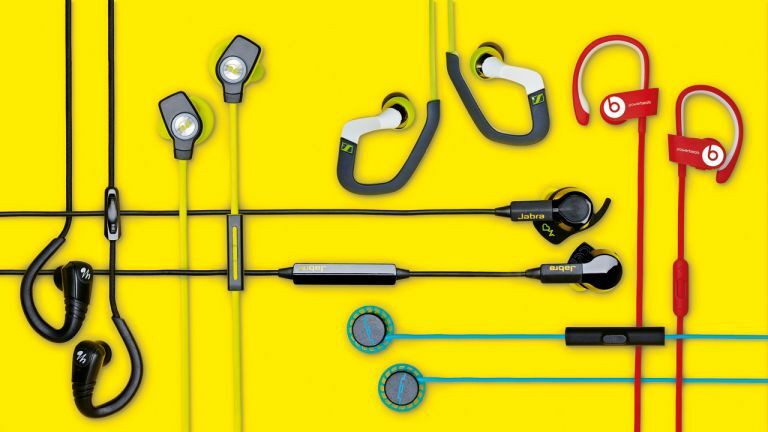 A new generation of sport-specific earphones promise to turn us all into temporary Rocky Balboas as we pound the hills and pavements, or work up a sweat in the gym. Combining great sound with (in some cases) smartphone and Bluetooth compatibility, they're truly performance-enhancing. Most importantly, they'll stay stubbornly but comfortably in your waxy cavities, so you can concentrate on your running rhythm without having to keep reaching up to insert them back into your ears. but in complete comfort. Sound quality is superior, especially at ambient levels, while audible alerts for low battery is a nice touch, preventing the horrible surprise of mid-song shutdowns. A clever 'flat' (in a good way) battery and folded circuit board mean these are, well, super-slim. Sitting almost flush to the ear, they can be worn comfortably under helmets, goggles and such like. They stay in place, too, thanks to a patented earhook and angled ear-tip combo. As well as being water-resistant and sweatproof, they're antimicrobial and washable. Bluetooth range is an impressive 50ft, and battery life is over five hours. The sound is a little on the trebly side, but they're a perfectly enjoyable experience overall. When you get back from your run, why not watch a movie? These comfy earphones are much more than mere music transmitters – they're your new coach. A tap of an earbud reveals your time, distance and heart rate (there's a monitor built in), with a voice telling you if you're working too hard or being lazy; and you can dissect your stats in greater detail via an app. The immersive Dolby sound curls around your earlobe like a pleasing sort of ear worm, and sound isolation is effective, too, meaning you can drown out passing lorries. Battery life is a modest five hours, but these are simply the best around. If you don't want your Top Gun soundtrack to cease mid-run as the battery dies, there are still good wired earphones around, such as Sennheiser's OCX 686G Sports. Like their wireless rivals, these are sweatproof, come with a carry pouch, and offer different ear-fit options and a remote control that enables phone calls. Earhooks keep them in place, while an adjustable clip on the wire, for attaching to your T-shirt, is a nice touch. The bass-orientated sonics are clear, and background noise is obscured well. These minimalist wired earphones are an enticing old-school option. Each bud is barely the size of a 20-pence piece, which means they slot into your ears quickly and imperceptibly; and they're remarkably secure, too, thanks to their unique angled design and a pliable rubber ring around each bud that wedges inside your lughole. Sweatproof, dustproof and waterproof, they're another pair to boast a useful clip on the wire, and they even come with free eartips for life. Sound quality is good, if a little on the bassy side, and they come in shades of white, black, blue and yellow. The box is swish, the carry case is swish… and the earphones themselves aren't half bad, either. Adjustable earhooks mean there's no forcing buds into lugholes, and they stay in place effortlessly.They're so light (24g), you'll hardly notice them (they're the least obtrusive pair in this comparison), and they're also sweatproof. A remote control enables you to skip tracks and take phone calls, while the battery lasts six hours and can be fully charged in 90 minutes. The sound quality is decent but by no means the best on test.